MOSCOW (AP) — Russians angered by the impending inauguration of Vladimir Putin to a new term as president protested Saturday in scores of cities across the country — and police responded by reportedly arresting nearly 1,600 of them. Among those arrested was protest organizer Alexei Navalny, the anti-corruption campaigner who is Putin's most prominent foe. 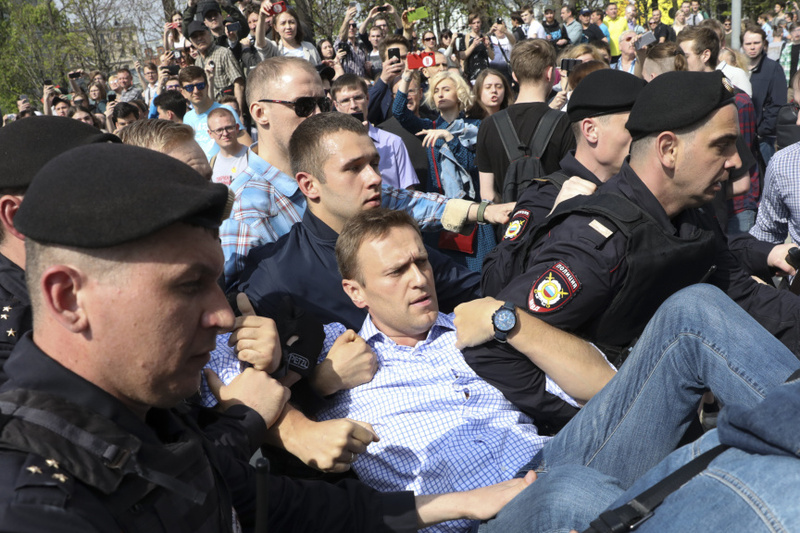 Police seized Navalny by the arms and legs and carried the thrashing activist from Moscow's Pushkin Square, where thousands were gathered for an unauthorized protest. "The United States condemns #Russia's detention of hundreds of peaceful protesters and calls for their immediate release. Leaders who are secure in their own legitimacy don't arrest their peaceful opponents for protesting," she tweeted.